I really a glyphs panel. So that I can select a specific glyphs. The Typography -> Show all font features are great. But if you have a font with a lot of option, or special display characters, or just need a special character. You can't select that. And, sidenote. In the typography panel, the tekst and checkbox are overlaying. Bump. For UI design this is essential. I've taken to using FontExplorer Pro's 'Characters' panel (double click the icon font, 2nd 'tab'), but it'd be nice to have this baked into the tool itself. It would also be really helpful to be able to search for glyphs by name/unicode number or ligature - the latter being really useful with icons that have been designed with accessibility in mind. 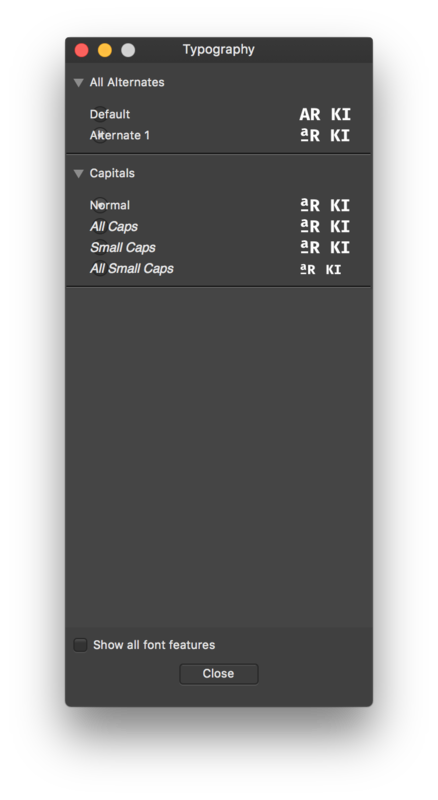 FWIW I've also had problems using icon fonts in Designer as the font name often isn't available in the font menu. A glyphs palette in AP would be very welcome. The current hex unicode option is long-winded hack! Having to change keyboard input source and source the correct unicode values just isn't user-friendly.